(Newser) – An outbreak of a rare virus has hit at least eight people who breed pet rats, the Centers for Disease Control and Prevention. The Seoul virus is a type of hantavirus and officials say they have never seen cases in the US associated with pet rats before, CNN reports. The eight cases were detected in Wisconsin and Illinois. 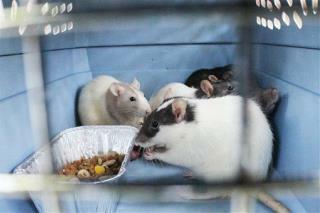 CDC officials say anyone who recently bought a pet rat in those states and experiences Seoul virus symptoms. which can include "fever, severe headache, back and abdominal pain, chills, blurred vision, redness of the eyes, or rash," should contact a health care provider. Sounds like the Black Plague! Hanivirus is pretty common in New Mexico and northern Arizona, Spread by breathing in airborne rat feces.